Physical – and financial – limitations cannot debilitate your spirit if you choose to stay strong. Every once in a way, Life will pin you down and nail your feet to the ground. You will feel crippled, beaten, battered and burnt out. That’s when you must make a choice – to stay strong. Staying strong is not rhetoric. It is an imperative in Life situations when you have no other evidence, except your own self-will, to assure you that you will prevail – no matter how grim your situation may be. The other day a friend of mine called me to say that he was feeling disillusioned and defeated. He is out of job, has cash to last just three more months and is very anxious about his future. He said he feared if he would even be able to provide for his young daughter’s education going forward. I could empathize with him completely. I have been out of work – and out of cash – for over 28 months now. No matter what we try, and what we do, work, and therefore income, remains elusive. In fact, it is in the darkest hour of my Life, that I wrote my first Book – “Fall Like A Rose Petal – A father’s lessons on how to be happy and content while living without money”(Westland, August 2014). I am humbled that my Book’s been sold out since its launch and my publisher has gone in for a reprint! My friend asked me, how do I manage to stay positive, and how did I manage to write a spiritual, uplifting Book, when my own situation was “grim and grave”. I must confess I also get drawn into depressive spirals. People, situations, events – none of these are in your control. Anyone – or anything – can cause your inner equilibrium to be disturbed. But every time I am disturbed or am plunging into a depression, my awareness – spurred by my daily practice of mouna(observing silence periods) – helps me leap back into staying calm, peaceful and anchored. The other thing I do consistently is to look around me and get inspired by Life, by people and by nature. When I do that I discover, every single time, how blessed I am in Life – despite my circumstances. That way, I celebrate my blessings, feel grateful, pick up myself and move on! My latest dose of inspiration came from a story buried in the inside pages (sad – I would have preferred it on Page 1 as the lead feature in all editions) of this morning’s The New Indian Express. 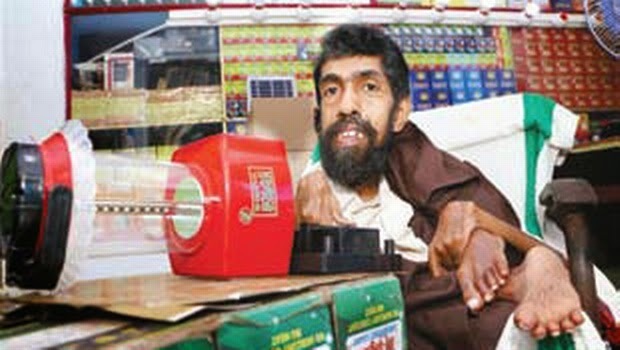 Ashwathi Krishna reports from Kozhikode (Kerala) about this amazing man, Madathinakath Johnson, who despite being crippled by polio leads a Life of dignity and creates value through his business. Johnson, now 45, was paralyzed by polio when he was barely six months old. But over the years of growing up, Johnson learnt to overcome his physical limitations. He set up a company, M-Digital, that makes energy-efficient lighting systems – LED lamps, solar-powered lamps and such – in 1993. Today his clientele are both from the institutional and retail sectors. His company’s products are available in 50 stores across Kerala. He starts his busy day with a prayer at 5 AM and believes that he must do whatever it takes to promote awareness of energy conservation and alternate energy sources – especially among the youth. When I read the story, I told myself: “Bravo, “Magic” Johnson!” American basketball legend Earvin “Magic” Johnson was first called “Magic” in 1974 when he was a star at his school. He was given the nickname by a sports writer who had just seen the 15-year-old prepster notch 36 points, 16 rebounds and 16 assists. But to me, Madathinakath Johnson is our very own “Magic” Johnson! Reading about him this morning made my spirt soar. I realized, one another time, that it is so easy for us to drown ourselves in self-pity. The smallest of our unmet expectations can drive us to despair. When we are lamenting about what we did not get or do not have, we miss the opportunity to try out different things. If one route is not working, we fail to see if there’s another way of doing things. Our self-obsession with our problems leads us to imagine that we are cursed and doomed. That’s when, as I learnt to do, we must look around us and we will find not one, but a million, inspirations like Madathinakath “Magic” Johnson. I inject myself with the spirit of people like “Magic” Johnson daily. That’s how I stay anchored, focused and on the path. That’s how, even if depression taunts and tempts me, I don’t succumb. That’s how, really, despite all that which may paralyze you, you too can ensure that your spirit is untouched – and unbroken!